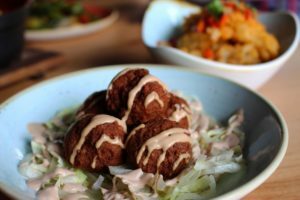 This month, we are showcasing a collection of specials based upon what you said love most about SHK and want to see even more of: delicious food, unique cocktails and exclusive offers. We hope you “fall” in love with the season as much as we have this October! By popular demand, we are back with a new specialty cocktail available all month for only $7! 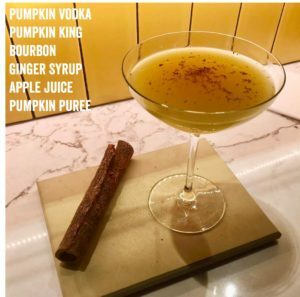 Perfect for students on a budget or an after-work outing with a group of colleagues, our bourbon-based Fall-Filling cocktail bursts with quintessential seasonal pumpkin and apple flavors, while a bite of ginger zests it up. As a finishing touch, the sipper is topped with sparkling brut for the perfect hint of crispiness. Stay tuned as we introduce a new cocktail available at a special price every month! Available anytime October 1-October 31 for $7. Whether hosting an intimate gathering for your nearest & dearest or a lavish corporate holiday party to celebrate a great year, SHK can accommodate groups ranging from 24-252 people for a myriad of event spreads including private dining, partial buyouts and full buyouts. SHK also offers full A/V capabilities for conferences and meetings. Contact info@sumiaohunan.com for more information. *Blackout dates include Halloween, Thanksgiving, Christmas and New Year’s Eve. Every Thursday, join us for live music by Berklee School of Music alums, Hanna Noh & Carlos Capacho. 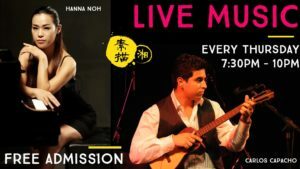 This dynamic duo brings their musical training – ranging from classical to Latin to jazz – centerstage at Sumiao to bring revelers one of the most unique live music experiences in Cambridge, all to be enjoyed while sharing in traditional Hunanense food and drink with modern twists. With the new season comes updates to our dynamic menu, and no fall menu is complete without pumpkin. Stop in to satisfy your gourd cravings with our Cinderella small plate or our Melted Gold soup, in addition to a series of new seasonal specialties. Get a preview of our updated menu on our Home Page. Whether you’re looking for after-work bites or to beat late-night cravings, our “Hunan Hour” has you covered by offering full-sized appetizers at half-price. 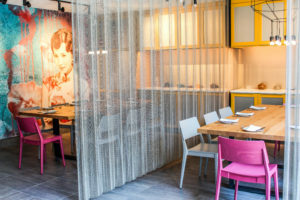 Enjoy a special menu full of Hunanese favorites such as avocado meatballs, garlic calamari and scallion steamed twisty rolls. Available daily from 3:30pm-6:30pm and nightly beginning at 9:00pm with the purchase of any specialty tea, mocktail or alcoholic beverage.